Sallie Page-Goertz is an Advanced Registered Nurse at KUMC Pediatrics as well as Medical Director of Reach Out and Read Kansas City. When ROR-KC was first formed in 1997, Sallie immediately embraced the program as a part of her pediatric care. 20 years later Sallie still treasures the moments she shares books and early literacy advice with her patients and families. She is an avid supporter of a child’s physical and cognitive well-being, and she understands the importance early reading can have on a child’s life. What is your favorite Reach Out and Read Memory? A young patient named Michelle reminded me that some children only have books of their own because of ROR-KC. Books are expensive and they are not always within a family’s budget. For Michelle, her family took ROR-KC’s reading advice to heart. They read to her often and her father even built a special bookshelf for her ROR-KC books. As she got older and she started to read on her own, those were the books she turned to first. It’s families like these where I know we are making a positive impact. Read more about Michelle’s story here. How has your understanding of ROR-KC grown over time? The biggest change is that we have much more information now about how babies and young children’s brains develop, and how economic disparities can have a serious impact on children’s language development as well. This new neurological data enforces how important ROR-KC’s read aloud mission is for young children. What are some of your favorite books to share with patients and why? Let’s Read is the book we share with new parents. I love opening it in front of babies and showing parents how their new child’s eyes light up and focus on the book. It’s a great way to open a conversation about reading early and often to their little ones. For slightly older children, I enjoy books that rhyme, like Dr. Suess. At that age children are starting to talk themselves and they love listening to how words sound. It’s fun because rhyming books feel like a game to them. ROR-KC also shares bilingual books as well. This is especially helpful when families might have a grandparent that would love to read with the child even though they aren’t comfortable reading or speaking English. What’s your favorite piece of family reading advice (or encouragement) to share? Changing how you encourage family members can be key to taking the pressure off reading aloud. Sharing a book with your baby sounds less daunting than reading a book with them. Also encouraging them to understand that the story doesn’t have to dictate the time you spend together. Feel free to open a book and make up a story, skip pages, ask questions. What color is this? How many animals are there? What do you think is going to happen next? Most importantly, enjoy that time you are snuggled up together. Those unique conversations are helping your baby’s brain grow. What’s your favorite personal reading memory as a child or with your own children? I have always been an avid reader. When I was little, I was the child that would get caught reading with the light on in the middle of the night. 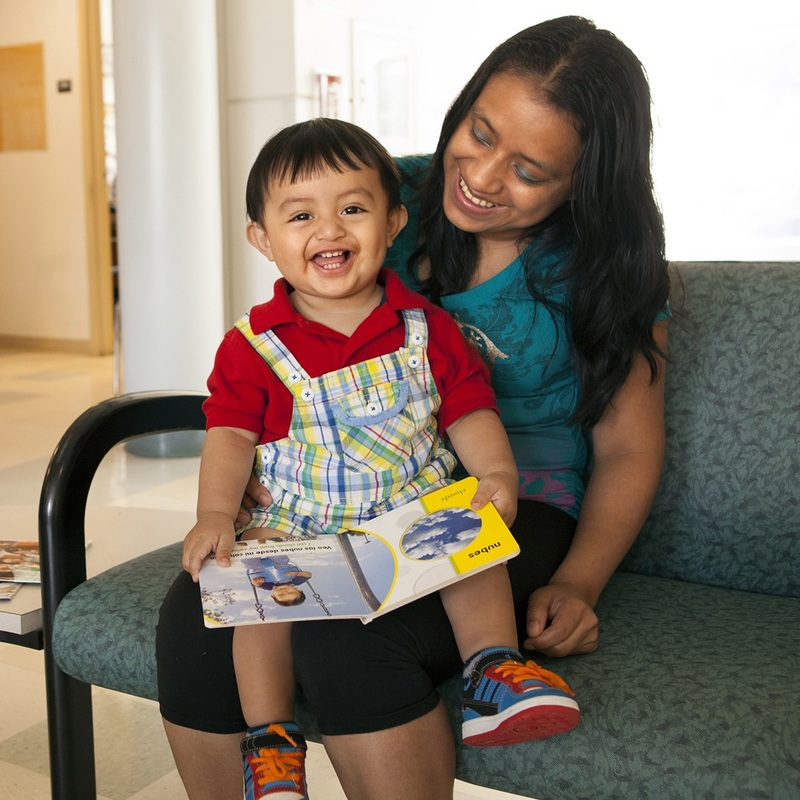 Whether it’s my grandchildren or my patients I love watching a child’s eyes light up when I bring in a book because it means that someone is reading to them. How are volunteer readers important to ROR-KC? We need people to set an example. A book doesn’t have to be a way to read to children, but rather a way to read with them. Showing parents and family members that story time is more of a way to have a conversation with your child. Watching a great volunteer reader can help take a load off for some parents who might find story time daunting. The following message is a guest blog from Sallie Page-Goertz MN, APRN. Sallie is the Medical Director of Reach Out and Read KC, and she recently gave a two-part presentation called “Parent Talk” about why it is important to engage in frequent, high-quality talk with young children. Her presentations were so informative and well-received that we would like to share that same message with you! Babies love to hear your voices. While in the womb, they heard your voices, as well as those who were around you! A fascinating study had women read to their babies before the birth. After the birth, babies listened to recordings of their mother and recordings of a stranger reading the same story – they were much more interested in listening to the story recorded by their mothers, a familiar sound! Photos courtesy of Reach Out and Read National Center. For children to learn to talk, they have to hear lots and lots of talking. The first 3 years of life are the MOST sensitive for development of later language skills. If babies do not hear lots of conversation, they lose an opportunity for developing strong connections in the brain that help them to communicate. When you talk to your baby, connections between neurons are formed that will help them learn to speak. Research tells us that the more words children hear between birth and three, the more words they know at 18 months of age and at 3 years of age. Sharing a book with your child is one way to get these conversations going! The way we talk to young children influences how they think about themselves, how they learn to regulate their behavior, and their willingness to try hard, and keep trying when learning new skills. For example, in the grocery store – one could tell that running child to “Stop, behave, you know you’re not supposed to run” or, one could say – “hey stop running and come help Mommy find the red apples that you like so much – let’s see if you can put four of them in the bag! Thank you for being a good helper”. In the first example, the child is chastised for unacceptable behavior, but doesn’t learn what might be acceptable. In the second example the child is told what they are not to do, but also told what they can do, and further are given an opportunity to learn about color, and counting and helping. Another example – the preschooler is working on putting a puzzle together – it’s hard for her to find the right spot for some of the pieces. In one scenario, her caregiver shows her exactly where it goes, she puts it here and is told “great job”. The child is pleased to have the help, and continues to look for that help. An alternative scenario, is that the caregiver suggests puzzle skills – look at the pieces with smooth edges, and see which ones will go together, or think about matching colors on the different pieces. The caregiver encourages the child to keep trying different pieces until she finds the right ones. Praise is given for trying again and again, rather than for being successful! In the second scenario, the child has learned a lot more – about puzzle making, but more importantly about not giving up when things seem too hard. 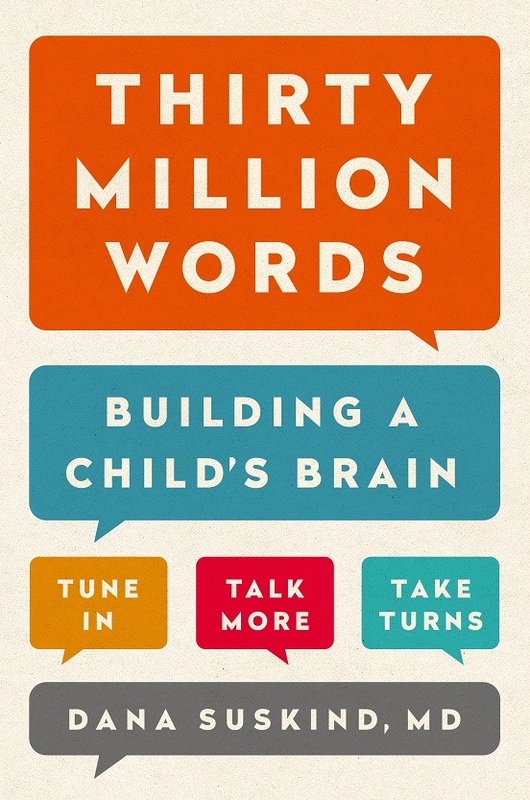 Dana Suskind’s book, Thirty Million Words: Building a Child’s Brain, has lots of great ideas to think about when being in conversation with your children. She presents the research that explains importance of being in conversation with children in an easy to read and understand way, and reminds us of the impact that our conversations can have on children, both negative and positive. Bottom line, words matter, and the more words a child hears, the more prepared they are to communicate and to learn as toddlers, kindergarteners and adults! So, go talk to your baby – watch how she reacts to your voice, to your singing. Even though she won’t talk back with words for many months, she talks back with her eyes and her expressions to let you know that she is definitely listening and learning.